Today I found out the famous Star Trek line “…to boldly go where no one has gone before” is thought to have been inspired by a passage in a White House issued pamphlet on space. It is useful to distinguish among four factors which give importance, urgency, and inevitability to the advancement of space technology. The pamphlet was published on March 26, 1958 by the Presidential Science Advisory Committee. It was originally made for the President’s benefit, but was released publicly by President Eisenhower, who hoped it would be widely disseminated throughout the U.S. and the world. It is a fascinating read (really, you should read it) and nearly as relevant today as it was when it was written, in terms of why we should pursue space travel and as a general, good non-technical introduction to space (as was the main point of the pamphlet). In the original Star Trek, the arrowhead badge worn by Enterprise crew members was exclusive to the Enterprise. 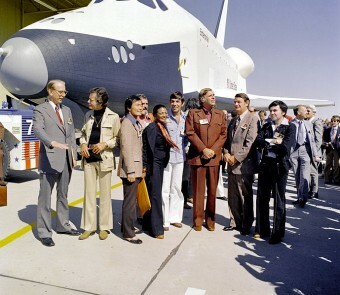 Basically, it signified those who wore it were part of the Enterprise crew. Crew members of other ships wore different symbols. This changed in the movies and later shows (though not, Enterprise) with the arrowhead becoming the insignia of all of Starfleet. The name Montgomery Scott was chosen because Montgomery was Doohan’s middle name and the character was portrayed as Scottish. Doohan was married three times in his life and fathered four children. He met his final wife, Wende Braunberger, when she was just 17 and he was 54, marrying her very shortly after their first meeting. The two had three children, the last in 2000, and remained married for 31 years until Doohan’s death in 2005 at the age of 85. The planet Vulcan is stated to be just 16 light-years away from Earth. If this were true in real life, that would probably put it in the trinary system 40 Eridani, which is 16.45 light-years from us. Both the Klingon language and the Vulcan language were initially very crudely developed by James Doohan. Later, these languages were expanded and refined by professional linguists, primarily by Marc Okrand. Doohan didn’t have a middle finger on one of his hands. While great pains were taken in Star Trek to conceal this fact, there are several episodes where this can be observed. These include: Cat’s Paw; Day of the Dove; and The Lights of Zetar. This can also be observed in a scene in Star Trek III: The Search for Spock and In Star Trek V: The Final Frontier. In the former, it can be observed when he hands McCoy parts for the Transwarp Drive and in the latter when he’s holding a plastic bag dinner which was given to him by Lt. Uhura. In the first two seasons of Star Trek, The Next Generation, you’ll notice that their uniforms are extremely tight. These uniforms were made of one-piece spandex. To make matters worse, the suits were intentionally sized too small so that they’d stretch extremely tightly over the actor’s bodies and not have any wrinkles. The actors hated them and eventually Patrick Stewart’s chiropractor told him that if he kept wearing them, it would cause real and possibly permanent damage to his spine. Hence, in season three, the uniforms were switched to being two-piece, less form fitting, and made of wool (obviously Counselor Troi still often wore tight Spandex, thankfully, as did many other guest cast members). A byproduct of the switch to the two piece uniforms for main cast members was that the top piece had a tendency to ride up on the actors. This gave rise to Patrick Stewart developing the habit of pulling down the top piece of the uniform periodically. He did this so much, that it became known as “The Picard Maneuver”. Originally, the Borg were not supposed to be a race of cyborgs, but rather, a race of insects. However, this was going to prove to be too expensive, so instead, they switched them to being a race of cyborgs and obviously came up with the name after the fact. The Interceptor (sailing vessel) in Pirates of the Caribbean film series is also used in the film, Star Trek Generations in a holodeck scene where Lieutenant Worf is promoted to Lieutenant Commander. Malcolm McDowell, who played Soran, is the uncle of the doctor on Star Trek, Deeps Space Nine (Alexander Siddig). When Whoopi Golberg first learned they were making a new Star Trek series, she wrote to the creators and asked if she could have a part because she had been a huge fan of Star Trek since she was a little girl. She particularly was enamored with the character of Uhura, who was one of the first African Americans to star as a main character on network television. Goldberg even stated when she first saw the character of Uhura on the show, she yelled “Momma! There’s a black lady on TV, and she ain’t no maid!” The producers initially ignored Goldberg’s request, as they didn’t think she was serious in wanting a recurring role on the show, but when they learned she was serious, they wrote the character Guinan for her. Nichelle Nichols, who played Uhura, once stated that she was going to leave the show, but Martin Luther King told her she needed to stay because she was not only playing a black person as a main character on TV, but she was also playing a character that didn’t conform to the stereotypical black person of the day, usually portrayed. Rather, Uhura was portrayed as an intelligent member of the crew and an equal to those around her. Nichols once worked for NASA. They hired her to recruit minorities and women to become astronauts. In that position, she actually was the one to recruit the first black man to go to space, Col. Guion Bluford. She also recruited McNair. At the end of Star Trek Generations, Kirk was originally killed off-hand by Soran, by getting shot in the back. Audiences hated this way for the famous Captain Kirk to die, so Paramount was forced to spend around $5 million to re-shoot Kirk’s death scene to be more heroic. The character of Data was originally supposed to be the Chief Science Officer. However, when they first started shooting, they realized this wouldn’t work because the blue uniform clashed with the android make-up Spiner had to wear. Instead, Data was made Chief of Ops, so he could wear yellow. Marina Sirtis, who ultimately ended up playing Counselor Troi, was actually originally cast to play the chief security officer. Interestingly, Denise Crosby, who played the chief security officer Lt. Natasha Yar, was originally cast to play Counselor Troi. Obviously the roles were switched by the time filming began. Further, the character of Counselor Troi was actually going to be gotten rid of after the first season, but when Denise Crosby asked out of the show and Gates McFadden also left, they decided to keep Troi around, rather than get rid of another female cast member. Gates McFadden was released from the show after season one because of constant arguments with the producers over the lack of development in her character. Particularly, she was unhappy about the fact that originally she had been told her character and the captain’s would become involved romantically, which wasn’t taking place. Obviously they second guessed their decision after the second season and asked her back. She only agreed after Patrick Stewart himself called her to try to get her to come back. She and Stewart were apparently very close friends, having worked together before Star Trek, The Next Generation. Denise Crosby wanted to leave the show, and ultimately did, for the same reason McFadden was unhappy, namely the lack of development in her character. The character of Counselor Troi has deep brown eyes. In reality, Sirtis has green eyes and wore colored contact lenses for the role at the request of the producers who thought brown eyes went better with her hair. You might have noticed Troi’s accent changed from the first season to the later seasons. This switch happened around the time her mother came on board. Originally, Sirtis had tried to do some sort of “alien” accent, to reflect the Betazoid side of the character. However, Majel Barrett, as her mother, just used an American accent. From that point, Sirtis decided to make Troi’s accent sound Eastern-European, with the idea that that’s where Troi’s father was from, hence where she picked up the accent. The character of Geordi La Forge was named after a long time Star Trek fan who was confined to a wheelchair, George La Forge. The character of Q was also named in homage of a real person, a British fan of the show by the name of Janet Quarton. You may have noticed that Star Trek main characters tend not to get promoted much. However, the one notable exception was Geordi. In the beginning, his character was a Lieutenant junior grade. By the second season, he had been promoted to Lieutenant. By the third season, he was made Lieutenant Commander. He also appeared as a Captain in one episode of Star Trek: Voyager (Timeless). The character of Wesley Crusher was originally supposed to be Leslie Crusher. Luckily for Wil Wheaton, this was changed and they decided to go with a son for Dr. Crusher. The name “Wesley” was Gene Roddenberry’s middle name. Data’s name was originally supposed to be pronounced dat-uh, rather than date-uh, but it was changed before filming. After season one of Star Trek, the Next Generation, Jonathan Frakes grew a beard in between the filming of that season and the next. He was going to shave it off, but when the producers saw it, they asked him to keep it for the show. If you were to zoom in on the Engineering schematic of the Enterprise in The Next Generation, you’d see a mouse on a wheel in Engineering and a Porsche in the main shuttle bay. Obviously these elements are too small to see on TV. In The Next Generation episode “The Arsenal of Freedom”, the killer hover probe was made primarily out of a shampoo bottle and a pantyhose container. Another interesting simple visual effect was how they made the “edge of the universe” in “Where No One Has Gone Before”. Basically, they just bounced a laser beam off of a beer can. The transporter visual effect (for TNG) was created by filming glitter swirled around in water. In the original, it was aluminum powder blown by a fan under a spotlight. The famous sliding door sound effect on Star Trek was made by James Wolvington, a sound editor, rubbing his shoe across the floor and then editing that up until he got a satisfactory sound. The character of Data was quoted as having a memory capacity of 800 quadrillion bits or about 100 petabytes. For reference, this is about 1/716 the amount of data downloaded on the internet every day. That might not sound like much in terms of his capacity, but it is currently estimated that all the digital data in the world today only adds up to around 8000 times Data’s storage capacity. Further, as recently as 2005, all the text data on the internet was thought to only add up to around 1/50th of Data’s capacity. One of the ongoing bloopers that happened on Star Trek was actors running into doors that didn’t open in time. Rather than actually make the doors motorized and electronic on the set, instead, they just had stage hands open and close them manually via ropes and pulleys. However, the stage hands occasionally would not get the timing right and because the actors were told they were to always act like the doors were going to open and not hesitate, they frequently walked and sometimes ran right into the doors. If you’ve ever been to a Star Trek convention, you’ll likely see a video of some of these bloopers, such as one video that shows a minute straight of numerous times William Shatner ran into a door that didn’t open. Patrick Stewart was not the first choice for Captain Picard. Rather, the role was first offered to Edward James Olmos. He turned it down (thankfully, not to disrespect him, but it’s hard to imagine someone playing the part better than Patrick Stewart). Olmos is best known for his work in Miami Vice as Lt. Martin Castillo. In the sci-fi world, he’s probably best known as Detective Gaff in Blade Runner or William Adama in Battlestar Galactica. The U.S. Navy has a motto: “Ex tridens scientia” (From the sea, knowledge). This was borrowed in Star Trek with Starfleet Academy having the motto: “Ex Astris, Scientia” (“From the stars, knowledge”). The practice of calling Riker “Number 1” stemmed from the British tradition of calling a first officer aboard a ship “Number 1”. The stardate used on Star Trek, The Next Generation often seems like random numbers, rather than an actual date. In fact, though, they do signify a real date/time system. There are 1000 units in an Earth year in that system, so 0 to 1000 would be year 0 to year 1. In the first episode of The Next Generation, the stardate is 41153.7; thus, the last three digits can be converted to the month and day of the year. So, in this case, 153.7/1000 = .1537 *365 = 56. Thus, by our calendar system, the first episode would be on February 25, 2364. The last episode, 47988, would then be on December 26, 2370. You might have noticed that the Klingons in the original Star Trek don’t closely resemble the Klingons in the later movies and shows. This was originally due to budget problems where Roddenberry wasn’t able to get the Klingons to look as he had wanted. Obviously this was no longer a problem with the movies and later shows. This change isn’t addressed until an episode of Deep Space Nine where Worf mentions an event that occurred to make Klingons look more human, but doesn’t elaborate further. However, this is later expounded upon in Enterprise where it is found a virus affected the Klingons and caused some of them to appear more human, as in the original Star Trek. NBC was originally concerned with Spock looking like a depiction of the devil (indeed, Roddenberry even originally had wanted Spock’s skin to be red). NBC even went so far as to have Spock’s ears and eyebrows airbrushed in promotional magazine campaigns to make him look more normal. Spock’s skin color ultimately was made to be normal, rather than red, due to the fact that the red color on black and white screens looked black. Spock’s hair style briefly became popular back in the 1960s among kids. Interestingly, Nemoy’s dad was a barber and once the show became somewhat popular, he kept getting kids coming in asking for “Mr. Spock’s haircut”, though most were ignorant of the fact that Nemoy was his son. To date, the Star Trek movies alone have grossed over $2.145 billion. Further, the merchandising gross for the entire franchise is estimated to be over $4 billion. I was not able to find gross numbers for the shows themselves, but one imagines they did pretty well for themselves, running for a combined 30 seasons (including the animated series). Just a note: “…no human (or ‘man’ as in ‘Earth man’) has gone before” wouldn’t be correct, since Starfleet had many alien members.